Your safety is the most important concern and the most critical factor contributing to a great experience on the water. All members and guests must be familiar with the following guidelines and information. While rowers are not required by Coast Guard regulation to wear life vests on the water, we have a great need to simply think about safety. After all, we face backwards, move quickly, sit low on the water, are very focused, and sit in fragile equipment. 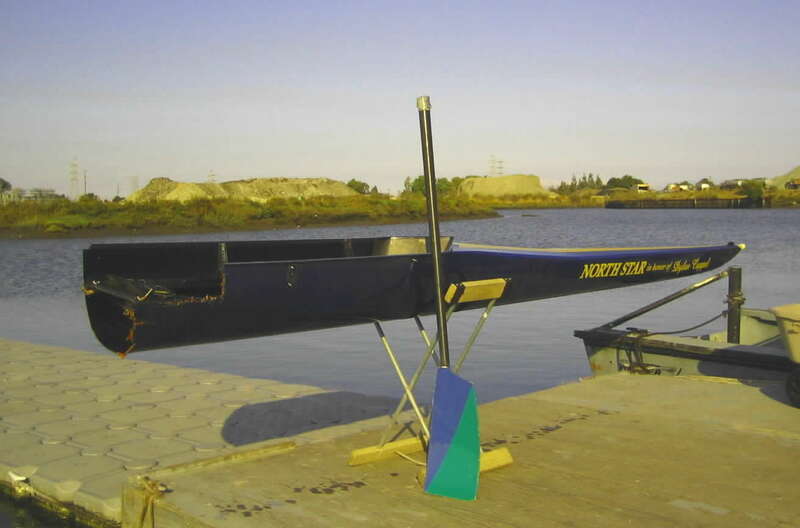 One great source for rowing safety is on the US Rowing web site; another is the BIAC Sculling Safety Manual, written by Mike Sullivan. The longer you row at BIAC, the more you respect the need for safety. Although our water never freezes over, we experience most of the extreme weather conditions mentioned on the US Rowing site. In addition, we share a busy marine waterway with ocean-going freighters, as well as other crew teams, harbor seals, sailboats, and powerboats. We experience tide variations of eight feet or more twice a day, and constantly changing weather and light conditions. Experience here will make you a better paddler or rower everywhere. Carry a cell phone in a waterproof pouch attached to the boat. It gives you a way to call for help if you need it. In all cases, BIAC members must obey BIAC's Rules and Regulations, please see the Safety section specifically. We have one of our country's nicest locations for year-round paddling and rowing. BIAC's watercraft are most often used between the hours of 5:00am to 7:30am and 4:30pm to 7:00pm. During the winter months, these are hours of reduced visibility. If you can't see (or be seen for) 100 meters, especially in fog, please stay off the water. If you cannot see others, they cannot see you. Be sure your outer layers of clothing are bright and/or reflective. Being seen on the water is important for the safety of everyone. All BIAC users in all boats, including coached team boats, are strongly encouraged to wear clothing that enhances their visibility including bright ("hi-viz") colors. A hat is not enough. Black or dark colored clothing is discouraged as you are less visible to others and so endanger both yourself and other users. It may impair a rescuer's ability to find you in the event you end up in the water. Please consider your safety and dress for visibility. Shells, and especially launches, need working bow and stern lights. This is a Coast Guard requirement. Please use lights without fail during twilight hours or potentially foggy conditions. If you don't know where you are going, you can't get there, or back! Your ignorance also poses a safety risk to others on the water. 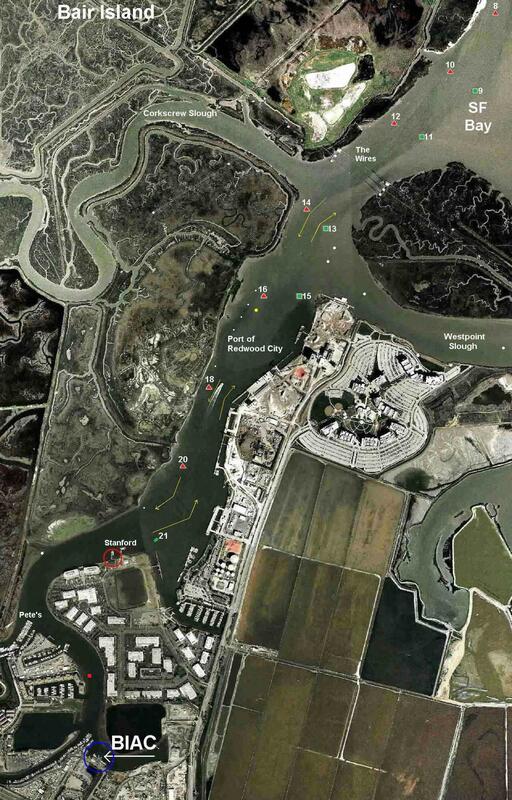 Above all, rowers should stay to the right on any waterway course. Paddlers don't always do this because they need to see us to avoid us! For information about BIAC's waters, see the image at right, as well as Where We Row and Paddle. As you leave BIAC and turn into the main channel, follow the green, odd-numbered markers. Stay within the channel (between the green and red markers) close to the green markers. As you return, follow and stay close to the red, even-numbered markers. Hitting a marker is an unforgiving experience, so use appropriate caution. Note: The channel is also called "waterside"; outside the channel is called "landside" or "shoreside." Use extra caution in the following areas, where collisions with other boats or fixed objects most often occur. Click on the links to view an image of these areas; click on the image to zoom in. The big bend by Pete's Harbor. Stanford's docks near marker 21. Watch for cross traffic both leaving and landing. Marker 18 and the wharves where the channel gets narrow. Stay close to the channel marker. Markers 14 and 13, the intersection of the channel with Corkscrew and Westpoint Sloughs, which also has a bend in it. Low tide squeezes everyone close to these markers.